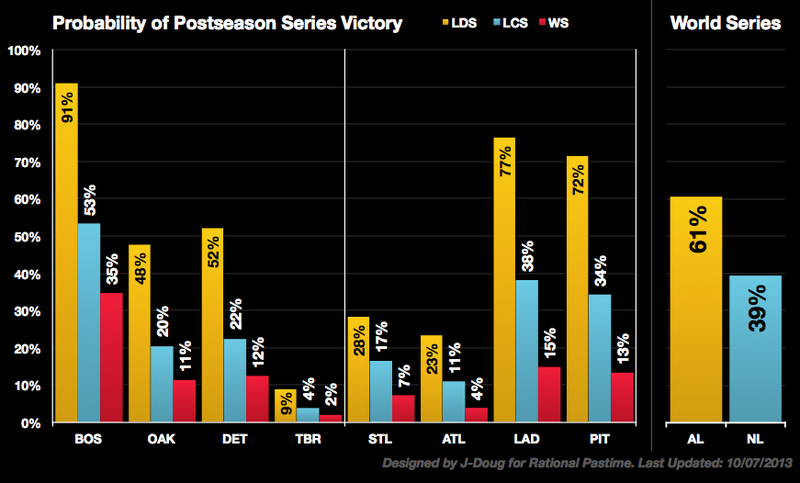 This article is part of a continuing series examining the postseason prospects of the eight MLB playoff teams in 2013. We've seen a lot of movement in the postseason prospects of our eight playoff teams over the past couple of days. The Tampa Bay Rays are now facing 10:1 odds just to defeat the Boston Red Sox, and 49:1 odds to win it all. The Oakland A's and Detroit Tigers evened up their series as well as their odds to advance. Following major Game 3 victories, the Pirates and Dodgers are on the verge of usurping their better-seeded opponents. One of those top-seeds is the St. Louis Cardinals who, atop the World Series probability leaderboards just days ago, have now dropped to sixth and are facing an early exit. 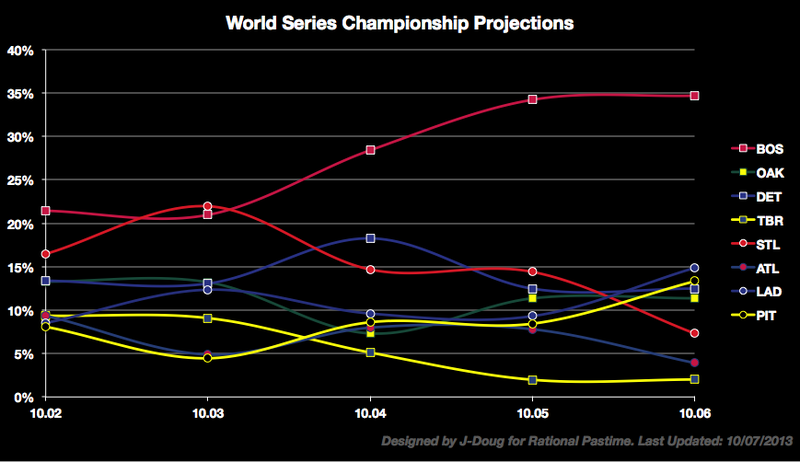 Thanks to Boston's high probability of advancement to the ALCS, their position as highest-rated team in the postseason, St. Louis' probable exit and AL home field advantage, the Junior Circuit is now favored to win the World Series by a 61-39 margin. The chart below plots Boston's rise to prominence and the Cardinals' decline, along with the wavering odds of the other six contestants. Check out series breakdowns beyond the jump. My, how the tables have turned. The odds were dim for the Pirates after game one, but so much can change in two games of a five-game series. The odds are now even that Bucs will advance to the NLCS after Game 4. That said, if St. Louis holds on, Pittsburgh has reason to worry. Despite the Pirates' accomplishments thus far, the system still picks the Cardinals to win if the series goes five. 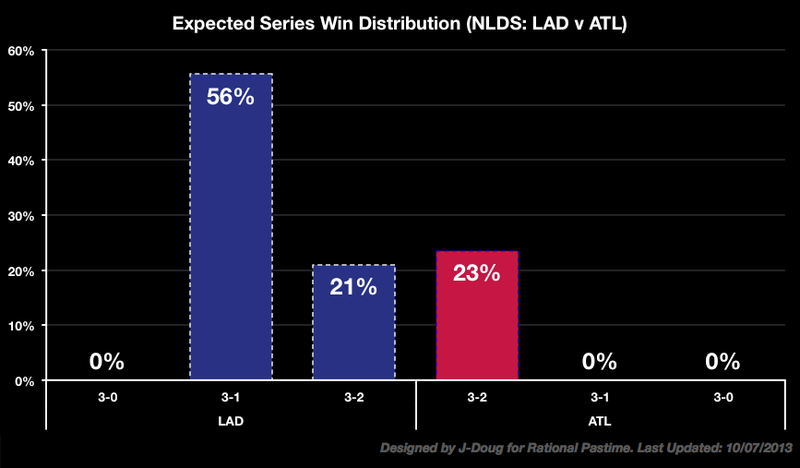 In the other NLDS, the Dodgers are sitting pretty. Facing elimination, Rational Pastime's system only gives the Braves a 44% chance to survive past Game 4. 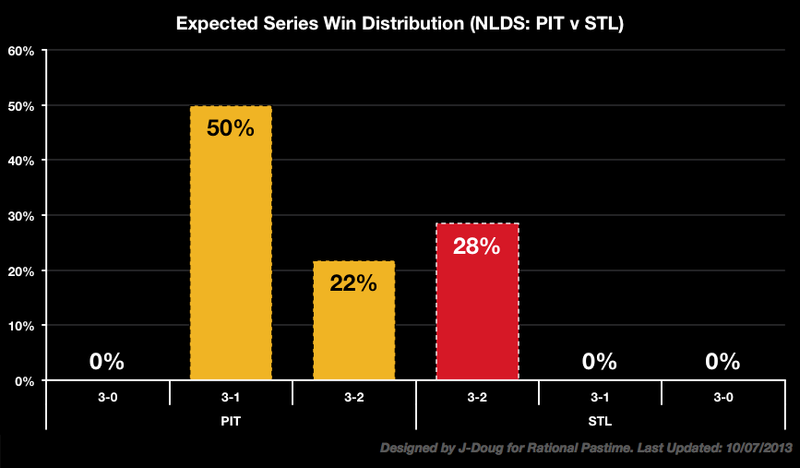 Altogether, we're looking at a 55% chance of a Dodgers-Pirates NLCS. The biggest movers on the rating system leaderboard have been the Cardinals and the Braves—and not in the right direction. Once looking like the second-best team in baseball, St. Louis has dropped to #4. The Braves, who were once even with the Dodgers, occupy the basement at #11 behind three teams that have been eliminated. Check back after today's games for more updates in Rational Pastime's MLB Postseason Projections series.